Deadly accidents, dirty stations and coaches, decrepit equipment and unpunctual trains mark India's vast, outdated and inefficient rail infrastructure. Will Japanese bullet trains make a difference? Japanese PM Shinzo Abe and his Indian counterpart Narendra Modi are laying the foundation stone for India's first high-speed rail line on Thursday, September 14. 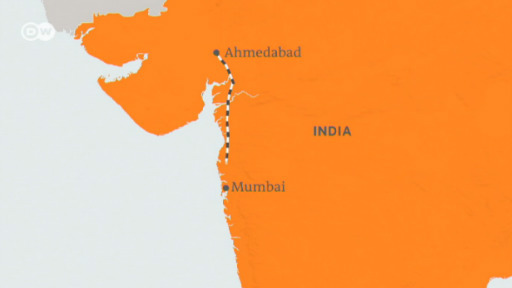 The train line will link Ahmedabad city in Modi's home state of Gujarat to India's commercial capital Mumbai. Japanese trains are ranked among the fastest in the world, and the planned train's projected top speed of up to 350 kilometers (217 miles) per hour is more than double the maximum speed of the fastest trains currently operating in India. It is estimated to slash travel time between the two cities from eight hours to around two to three. The agreement for the 508-kilometer rail network was signed in 2016, with plans to make it operational by 2022-23. PM Modi hopes the project "will launch a revolution in Indian railways" and "become an engine of economic transformation" in the South Asian nation. Since taking office in 2014, Modi's government has repeatedly vowed to modernize India's vastly outdated and crumbling infrastructure. Developing a state-of-the-art high-speed rail network would fit neatly into those plans. India's current colonial-era rail infrastructure is enormous and provides the main form of long-distance travel in the country. It is also one of the world's busiest networks, with some 23 million passengers using it daily. Despite its significance, the infrastructure remains poorly maintained and inefficient, lacking both modern signaling and communication systems. The notoriously unsafe nature of rail travel in India can be witnessed by the regularity with which train accidents take place across the country, claiming thousands of lives every year. A government report in 2012 said almost 15,000 people were killed every year on India's railways. Modi recently replaced his railway minister after a series of derailments, including one last month in which at least 23 people lost their lives in northern Uttar Pradesh state. Nearly 150 died in a similar accident in November last year. PM Modi's administration has pledged to improve rail safety and pump more money to make trains safer, faster and efficient. The government says it is investing $137 billion (€115 billion) over five years to renovate the crumbling network. Still, when compared to a country like China, India is far behind in terms of offering quality and reliable train travel. And in terms of a high-speed rail network, the gap is tremendous. China has built its high-speed rail network at a rapid pace over the past decade. It now covers some 22,000 kilometers, which is around two-thirds of the global network. The Chinese government wants to expand it to 30,000 kilometers by 2030. It is spending a whopping half a trillion dollars on high-speed rail infrastructure as part of its current 5-year plan. Japanese trains and technology are now expected to open a new chapter in Indian railways, laying emphasis on safety, speed and service. As part of the deal, India is receiving cutting-edge Shinkansen locomotive technology, which is fabled for its reliability. A powerful symbol of Japanese industrial prowess and engineering might, the Shinkansen is renowned for its excellent performance. The train has so far not had a single accident or fatality since its launch and its average delay is less than a minute. Indians hope this record will be replicated in their country as well. The technology transfer and local manufacturing that Japan has agreed to is also expected to boost India's domestic industry as part of Modi's "Make in India" campaign to transform the nation into a manufacturing hub and generate millions of jobs for its youth. "Indian and Japanese rail construction firms have already had a long track record of co-operation in the construction of a number of MRT projects in major Indian cities, so there is already a strong record of joint co-operation in both technology transfer and Make in India aspects," Rajiv Biswas, Asia-Pacific Chief Economist at IHS Markit, a global information and analytics firm, told DW. Still, carrying out construction of high-speed rail lines is an incredibly expensive affair. For the Indian government, shelling out billions on such projects would overstretch its coffers at a time when it is striving to lower its fiscal deficit. To make it an attractive proposition, therefore, Japan is providing billions of dollars in soft loans to finance the Mumbai-Ahmedabad venture. Tokyo's generous funding accounts for over 80 percent of the total cost of around $17 billion and it comes with a miniscule interest rate of 0.1 percent over 50 years. The repayment is set to begin only 15 years after receiving the loan. In comparison, economists say, such loans from multilateral financial institutions would typically cost around 3-7 percent interest with repayment periods of about 20-30 years. The favorable terms India has managed to secure from Japan symbolize a significant strengthening of ties between two of Asia's largest economies, whose leaders Abe and Modi have forged a close personal relationship. Their countries also share common strategic interests, with both wary of an assertive China gaining more power and influence in Asia. By selling the Shinkansen to India, Abe also hopes to boost its sales to other countries and, in the process, rejuvenate Japan's moribund economy. The deal could help ensure that Japanese train makers remain competitive on the global market amid ongoing Chinese offensive to become the world’s preeminent supplier of trains. High-speed train manufacturers in Japan and Europe have been facing a challenging environment as Chinese firms - whose technology remains relatively inexpensive - have increasingly sold trains to cost-conscious countries across Asia and Africa. In 2015, China won a high-speed rail project in Indonesia that Tokyo had thought it would secure. Thailand and China are also jointly developing a multibillion-dollar high-speed railway line that will ultimately link Bangkok to southern China. Beijing harbors plans to build a massive high-speed rail network connecting the Chinese city of Kunming with the Southeast Asian nations of Laos, Thailand, Malaysia and Singapore. In this context, the project in India is a welcome opportunity for Japan to expand the Shinkansen sales, given that the South Asian nation is only at the beginning of a long-term program of building high-speed rail linking its major cities. Analysts say European firms like Siemens could also benefit from India's efforts to modernize its railway infrastructure. IHS economist Biswas points out that the Indian government has been discussing joint co-operation for development of its high-speed rail networks with a number of nations with leading-edge technological expertise, including Germany. The German government has agreed to finance a feasibility study into a high-speed railway link between Chennai and Mysore, and is also in talks with the Indian government regarding the feasibility of building a new Mumbai and Hyderabad rail link. "If the German government plays a key role in future infrastructure development planning for some of India's railway networks, this could help to create opportunities for German railway equipment manufacturers," said Biswas. India and Japan sign nuclear deal - A risky business? India is building a high-speed rail line, with Japanese technology. Starting in 2023, the Shinkansen will transport passengers from Mumbai to Ahmedabad in just two hours.